“NPO MEGATEK” has developed and started full-scale production of machine for ceramic welding repair – "MaKS”, designed for hot ceramic repair of industrial furnaces’ refractory lining. 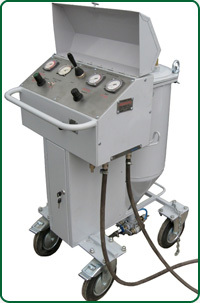 Machine "MaKS” is reliable, safe and convenient in operation of ceramic welding repair. Machine allows to use all ceramic mixtures produced by “NPO MEGATEK” with productivity required in each specific case from 50 till 160 kg / hour in oxygen medium through the flexible pipeline and lance to the place of ceramic welding repair. “NPO MEGATEK” provides warranty and post-warranty service of machine. “NPO MEGATEK” produces video monitoring system “VMS” for performance of repair works in the hard-to-reach places of furnace and monitoring of condition of lining. Video monitoring system consists of camera installed in the cooled case. Camera can be aligned manually under various angles 0°, 45° and 90° towards the axis of the case allowing observing inaccessible to direct visual monitoring zones of the furnace. Video monitoring system is completed with color monitor and device recording digital signal received from video camera. Basic technical characteristics of "VMS"